I am so excited today because I am going to Berkeley to meet my blogger friend Em! Em and I started commenting on each others blogs about 3 months ago and we just clicked. We actually wrote “real” comments on each other’s blogs instead of the usual, “yum, your dish looks great.” Em is witty and funny and her posts always give me tons of information as well as a chuckle. Her blog is full of nutritional facts (as she is a nutritionist) and delicious recipes, check it out here. Em resides in London but recently moved back to Berkeley to study for a few months. Perfect timing as far as I’m concerned. I promise to take pics! Em, is that OK with you? You better put something cute on, just kidding. Anyway lets move onto to this scrumptious recipe. This is my go-to Easter brunch cake. I have been making this cake for the past 5 years and it has become an Easter hit! When I get invited to the Fisher’s for brunch each year, the one request I get is to be sure to bring this cake. I am beginning to think that it’s actually the cake that is invited to brunch and not me. Hmmmm…. 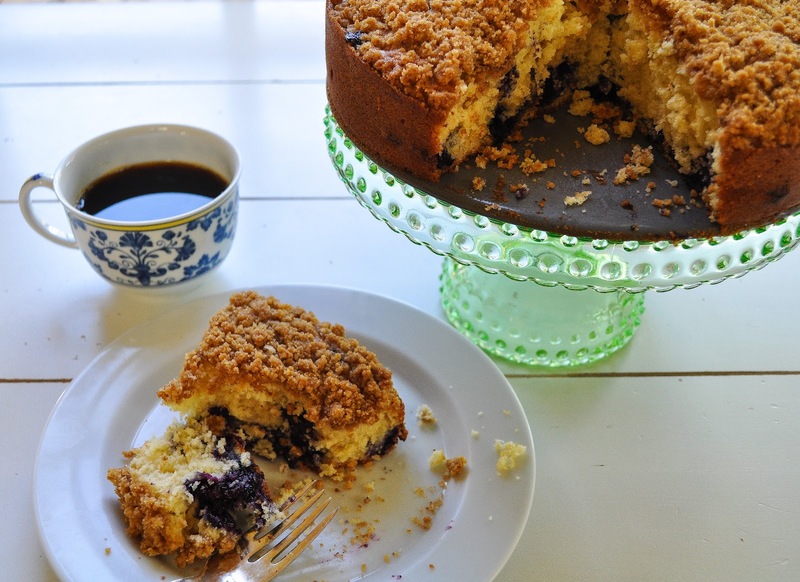 You don’t have to save this cake for Easter brunch, as it’s a great cake for any occasion. I often make this up to enjoy on a lazy weekend with a nice strong cup of coffee. This cake goes quickly so make sure to grab yourself a slice before the crowd dives in. 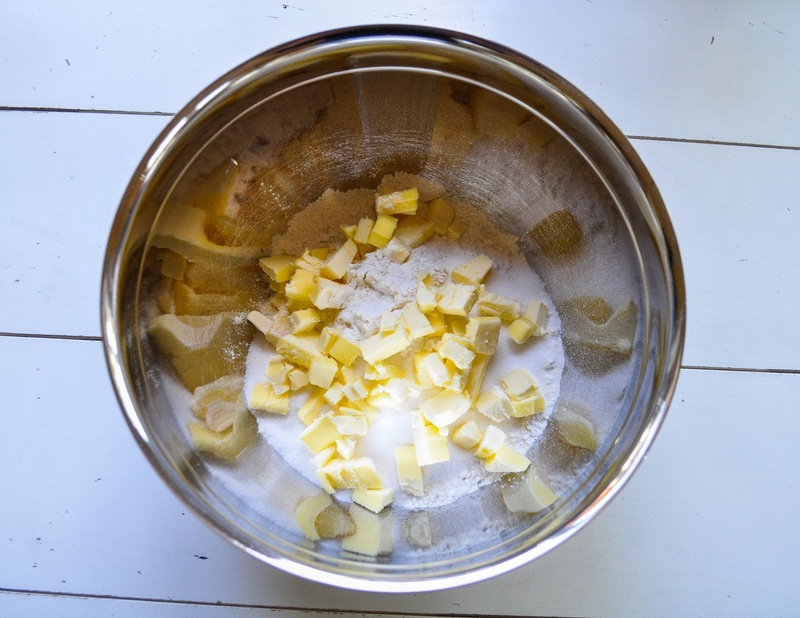 12 tablespoons (1 1/2 sticks) cold unsalted butter, cut into small pieces – You will use 10 tablespoons for the cake. 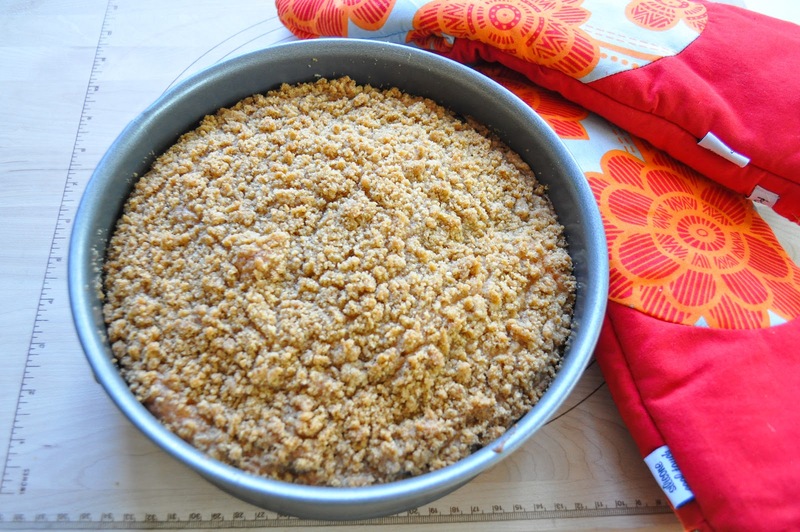 Make sure to place the remaining 2 tablespoons in the fridge till you make the topping. Position a rack in the center of the oven, and preheat the oven to 350 degrees. 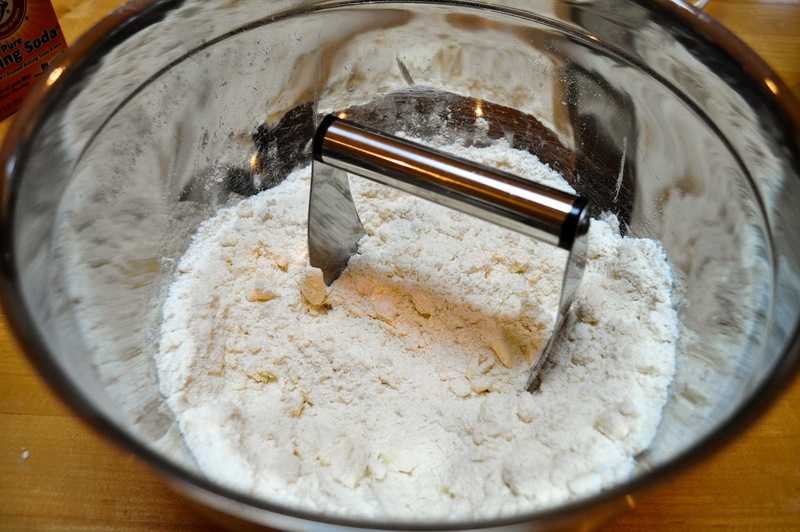 10 tablespoons cold butter Mix up the ingredients with either a pasty blender or an electric mixer until it resembles coarse meal. 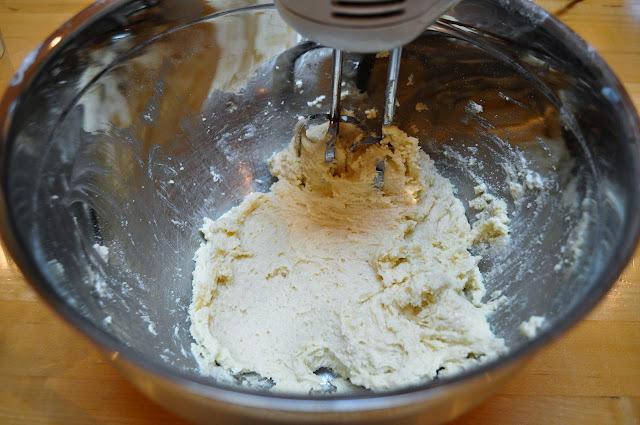 I actually used a pasty blender to break down the butter and then used my electric mixer to combine it all. 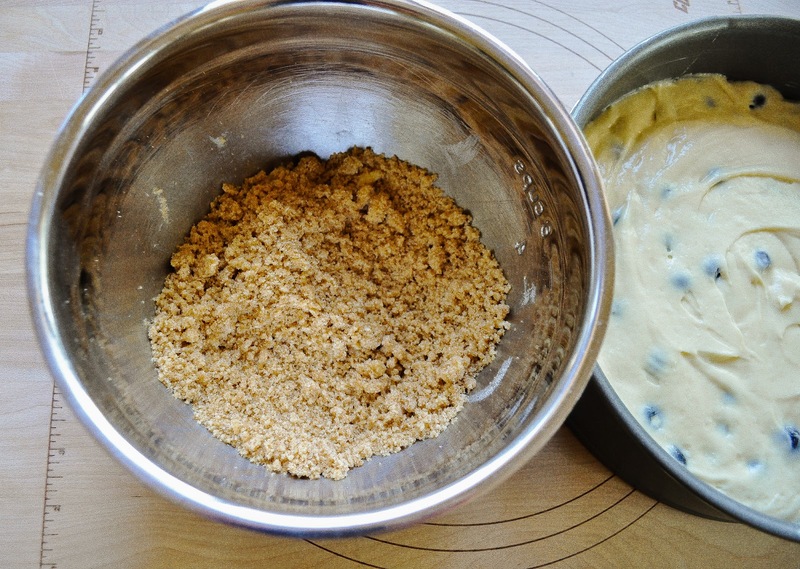 Remove 1 cup of this mixture from the bowl and set aside for the topping. Add 1/2 teaspoon baking soda and 1/2 teaspoon baking powder to the remaining mixture in the bowl and stir to combine. 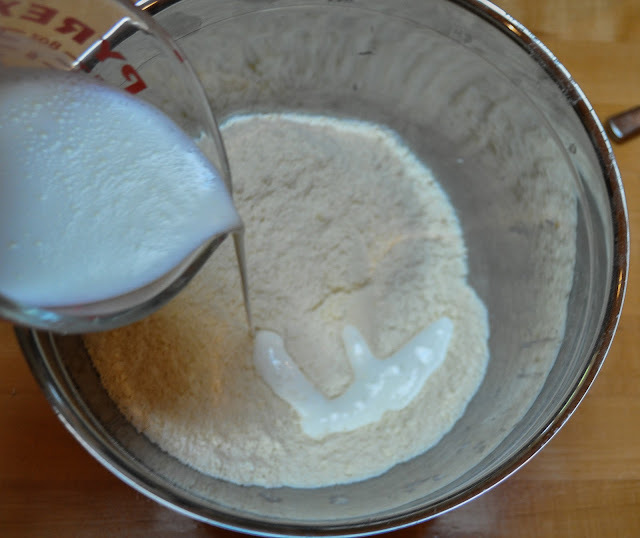 With the mixer running on low, mix in the 3/4 cup buttermilk until combined. The batter will be a bit thick at this point. Once the buttermilk is combined, add in the egg and the 1 teaspoon vanilla; mix the ingredients together until combined. 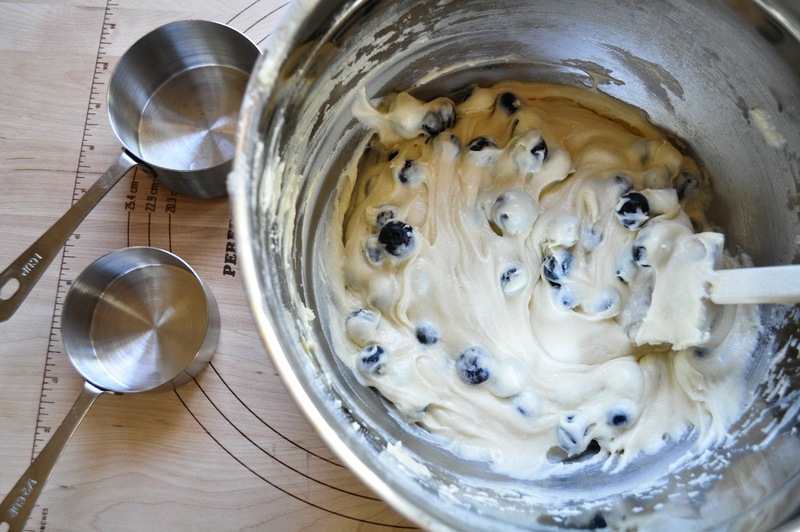 Mix the batter for 1 minute on high speed to aerate the batter. 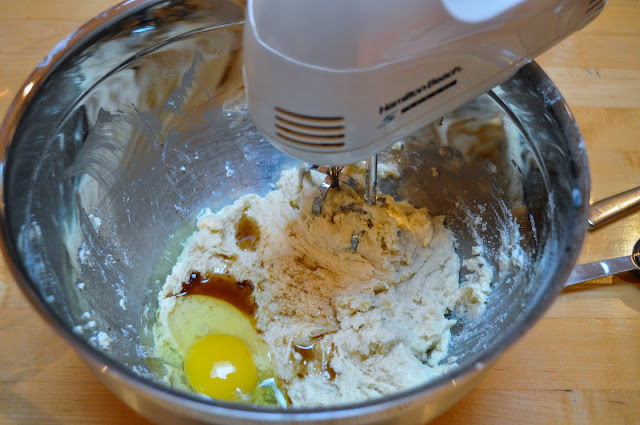 See how much lighter the batter got after adding the egg and vanilla? 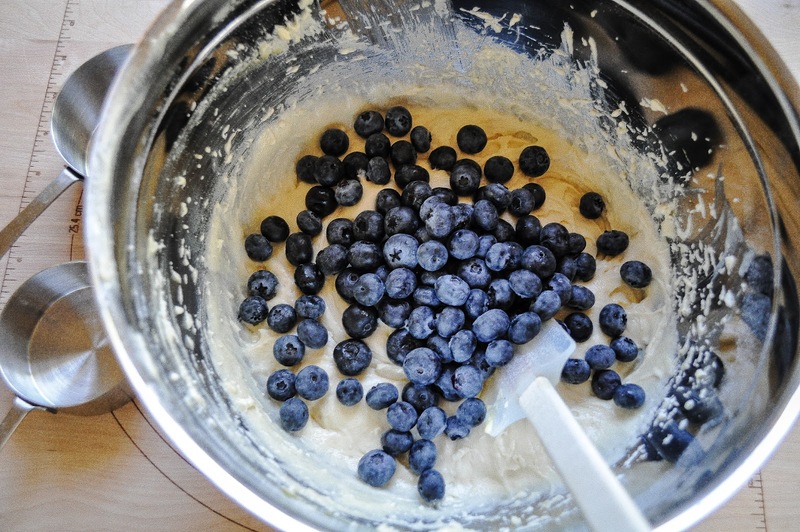 Fold in the blueberries, using a rubber spatula. Mmmmm, I just love fresh blueberries. Scrape the batter into the prepared pan and use a spatula to flatten the top and make things even. 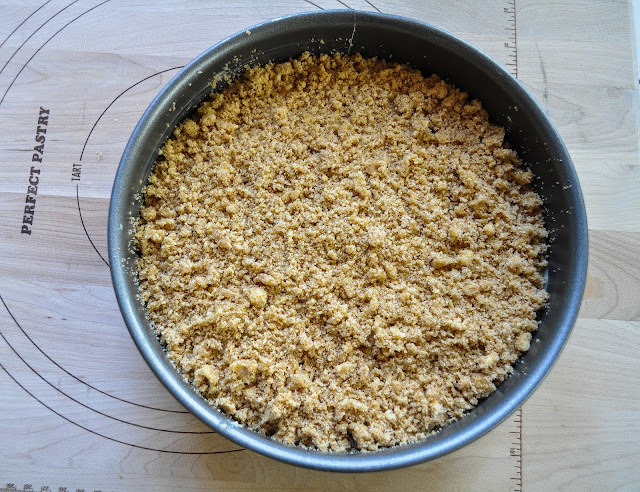 Place the reserved 1 cup topping mixture into a bowl and add the 1/4 cup brown sugar and the 2 remaining tablespoons of cold butter. 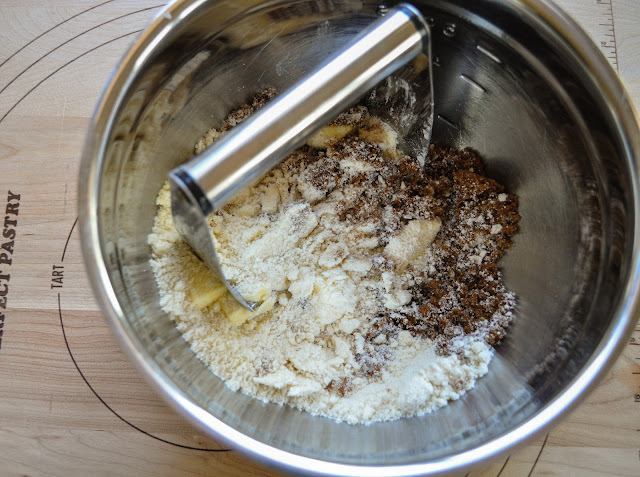 Mix with a pastry blender or your fingertips until crumbly. Tip: Make sure that you get the 2 tablespoons of butter out from the fridge right before you are going to use it. You want your butter to be cold for this step. 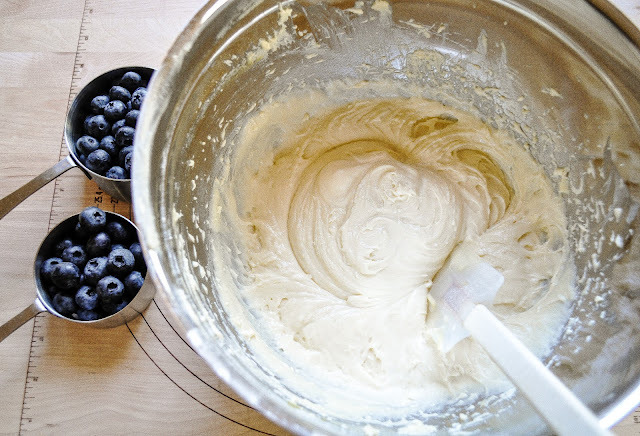 Sprinkle this mixture evenly over the cake batter. Bake the cake until a wooden toothpick inserted in the center comes out clean, about 50-55 minutes. 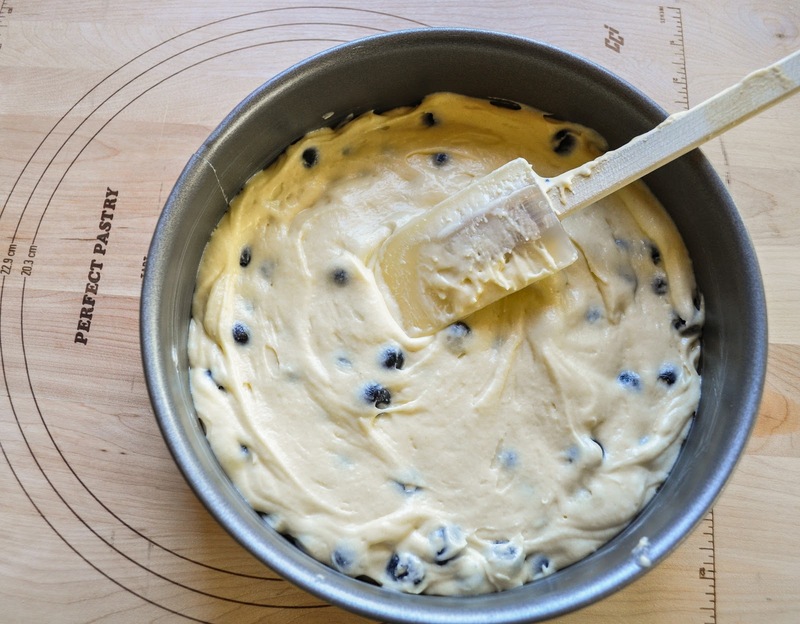 Allow the cake to cook in the pan on a wire rack for 20 minutes. Then carefully remove the sides of the springform pan and place the cake on a serving plate. 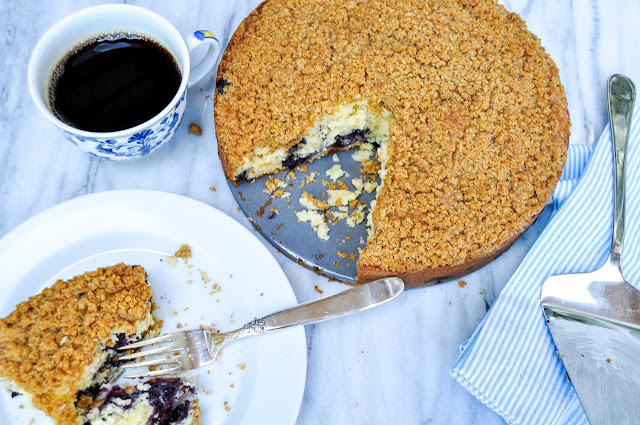 Throw on some confectioners’ sugar if you want to make it look fancy. I usually do this last step, but I forgot to today! Pour yourself a nice dark cup of coffee, sit back, read the Sunday paper or your favorite blog and just relax! 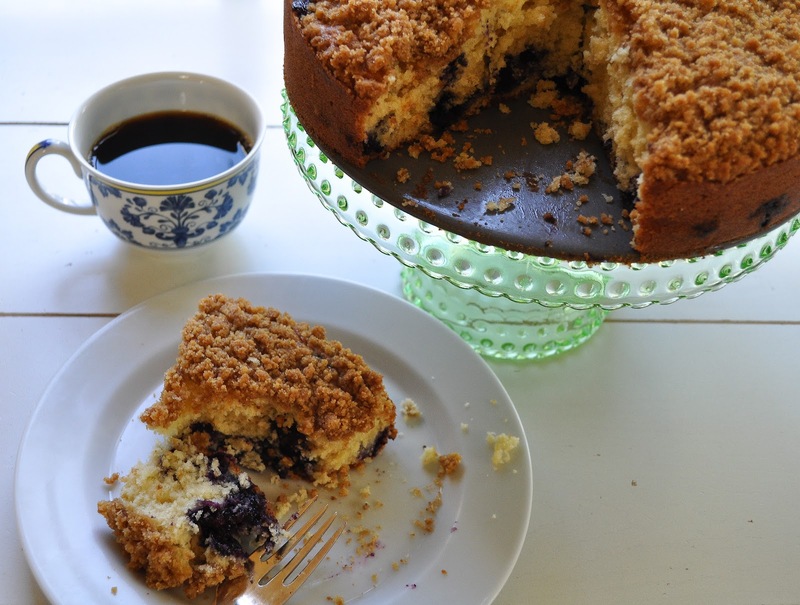 Bring this coffee cake to any brunch and you will be sure to be invited back! Can you make this recipe Gluten Free? 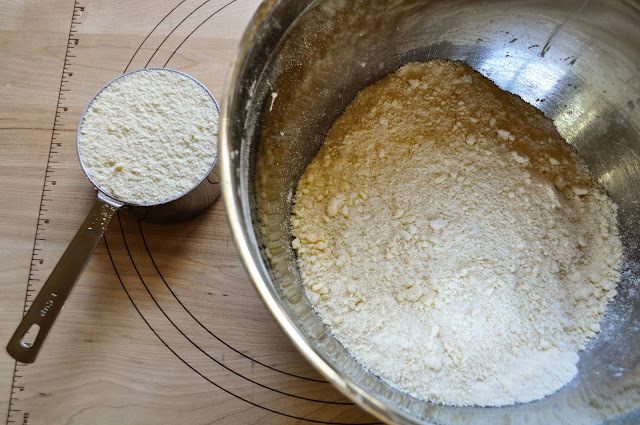 Lets say, that I can substitute the All Purpose Flour for a Gluten Free flour like Brown rice, quinoa, or any other gf flour, would it work the same? I was sitting on my computer looking for a nice desert to make tonight that is a bit different from brownies and chocolate bars that are everywhere! and i found this heavenly desert! Thank you! I am getting up to make this right now! Hello there, is it ok to use canned blueberries? I know fresh is best but they don’t grow here in our country. Greetings from the Philippines. looks good girl! Wonder if I can use the berries I froze last summer? Have fun today meeting Em. Hi Carolyn! Yes, you can totally use the frozen berries.I would rinse them under cold water first to get off any ice crystals and let some of the color come off. I think when I used them once and my cake was a bit more purplish in color. I actually have an easy smoothie recipe for you that incorporates frozen berries. I have not blogged it because the color is not pretty. Take 1 cup frozen blueberries, 1 cup coconut water, 2 packed cups spinach, 1 banana & 2 tablespoons flax seed. The flavor is delish and you gets your veggies and antioxidants all in one. 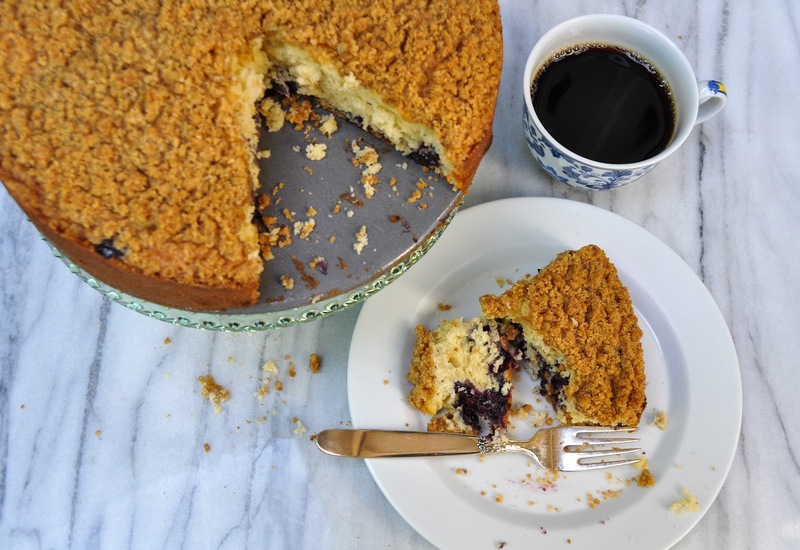 I think your kids would love it sans the flax seed.